When it comes to Christmas I like to go all out and decorate everything. 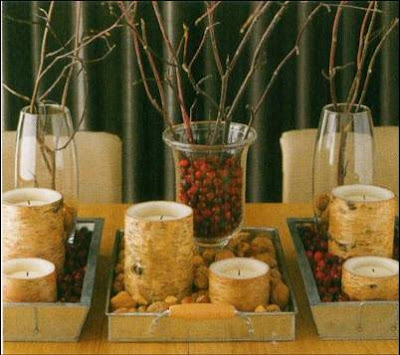 I like to make most things myself, and use alot of fresh items like flowers, boxwood and cranberries (no fake Santas in my house). 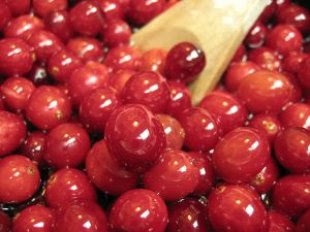 Cranberries are inexpensive and can be purchased at your local grocery store during the weekly run, no special trips to a craft store for these ideas (well ok, maybe one trip). Now that I live in an apartment building I can't make this wreath, but it is one of my favorite things to make right after Thanksgiving. Its super easy, very inexpensive, and looks great when you're done! Just get a styrofoam wreath (square or circle), paint it red, and go to town poking toothpicks into cranberries and then poke into the wreath till its all filled up. 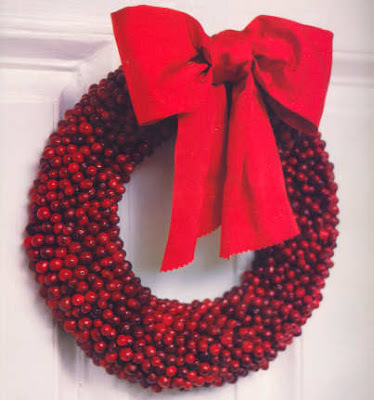 Another cranberry wreath idea comes from Martha Stewart. String cranberries and then wrap around a simple wreath, use with or without a bow and it looks great! I also love this idea for all over the house. 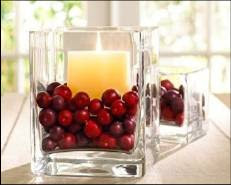 Just put some cranberries at the bottom of a glass vase, and instant chic Christmas decor! Great for flowers, candles, or branches like below. 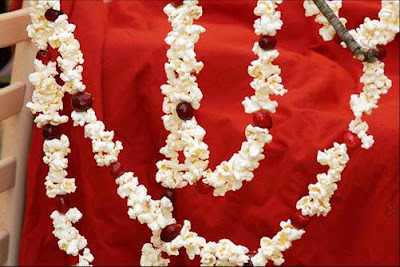 And last but not least, the very traditional popcorn and cranberry stringing. Can be used many places other than just the tree. Try wrapping around your stairs (do this one if you have no carpets on the stairs, cranberry stains are not fun), drape on a mantle, or drape over a hall mirror to create a welcoming look in the front hall. 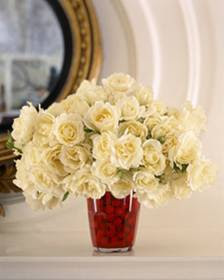 These look great, I especially like the white roses in the cranberries. I keep thinking I am going to make my own wreath this year but time keeps slipping by! What a great post!!! 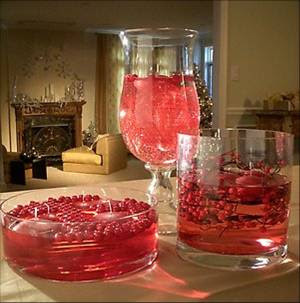 I'm thinking of doing a pretty traditional Christmas ths year & the cranberries are awesome!